In the summer of 2001, Tamdin learned that his father had died at age 57 after suffering four long days of acute stomach pain. Not a single healthcare worker was available in or near Tamdin’s village to prevent his untimely death or even to determine its cause. Tamdin believes that just knowing how to perform CPR could have saved his life. 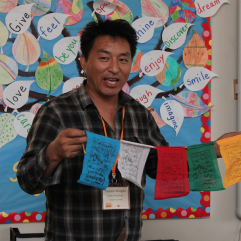 In memory of his father, Tamdin started the Tibetan Village Project in 2001 to fund a medical treatment and prevention program in his village. In the years since, TVP has expanded its programs to support community development with a focus on social enterprise programs that include skills training, business education and enterprise loans. Tamdin received a B.A. in Business Administration from the University of Colorado in Boulder, and worked for Accenture as an IT Consultant for several years prior to becoming the executive director of TVP. Tamdin travels each year between his adopted home in Colorado and Tibet.